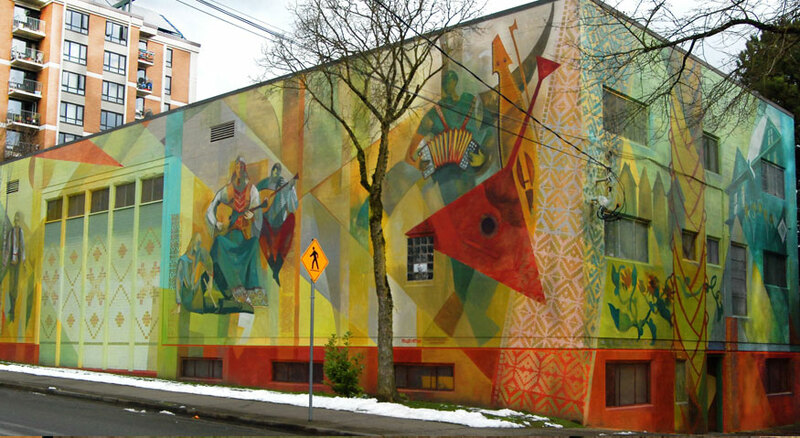 The Hall occupies a prominent location in Strathcona, a community in East Vancouver that is home to hundreds of artists and host to numerous arts festivals and performances throughout the year. This historic building,originally constructed in 1937 by the Croatian community, was purchased in 1947 by the Federation of Russian Canadians to enhance their community and culture. Theme: The design expresses levity and timelessness, with floating figures and soft colors. Thin washes were applied in many successive layers. The color palette was inspired from Etruscan and Byzantine frescos. Underlying form of the mural pays homage to the Russian AvantGarde of the turn of the last century, specifically artists such as Malevich and Kandinsky. These abstractions form the underlying shapes that run through and around the building.